Olathe High School Class of 1968 — 45 years later. Photo Copyright Wilborn & Associates. Photos still can be ordered by emailing wilbornphoto@earthlink.net or by calling 816-531-9000 and tell them you want a print of the Olathe High School Class of ’68 photo taken on Oct. 5, 2013. Cost is $21 either by check or credit card. 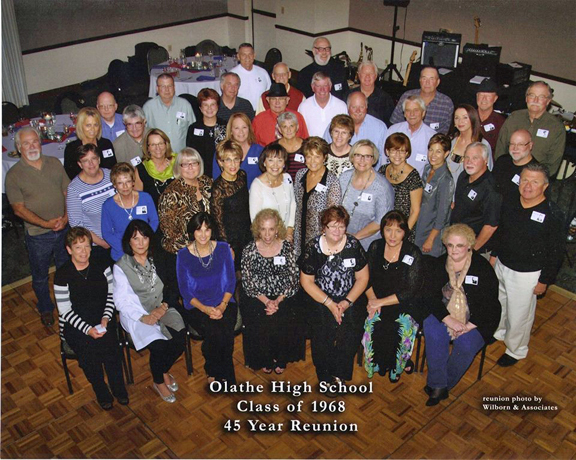 Olathe High School’s (now Olathe North) Class of 1968 had its 45-year reunion Oct. 4-5. Friday night’s get together was at Bass Pro’s Uncle Buck’s restaurant. Saturday night’s festivities, which will included a special performance by the OHS Class of ’68 Reunion Band, took place at St. Andrew’s Golf Course. Members of the OHS Class of ’68 may use this page to share photos, videos, stories and remembrances of the 45th as well as other class reunions. Photos should be in jpeg format, 72 resolution and include information of people in the photo, when and where it was taken and by whom. Photos, stories, and remembrances can be emailed to: viewfromthemidwest@sbcglobal.net. Videos should be in .mov format or links to youtube movies can be mailed to: viewfromthemidwest@sbcglobal.net.